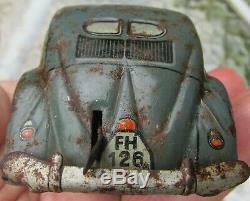 Horndlein clockwork Volkswagon beetle - KDf wagen. Horndlein only manufactured toys from 1938 in Germany until the war (1939) - about a year. The VW Beetle itself was only in production from 1938 and before the war was only used by Nazi party members. This toy then was made before release of the Beetle to the general public. Horndlein must have had close connections to Hitler in order to produce this toy as the tooling must have been planned before the manufacture of the real car.. The motor works although I don't have a spare key. 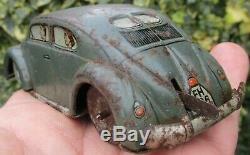 Horndlein 1938 Germany Volkswagen Beetle KDF Wagen Germany rare clockwork works. 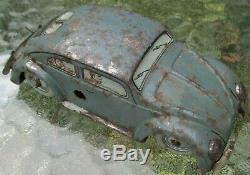 Horndlein 1938 Germany Volkswagen Beetle KDF Wagen rare clockwork car works. Fritz Horndlein clockwork Volkswagen beetle - KDf wagen. Rusty but motor works, Horndlein only manufactured toys from 1938 in Germany until the war (1939) - about a year. This toy then was made before release of the Beetle to the general public and may well be based upon a prototype VW with a narrower windscreen than the final version. Perhaps 126 was the prototype number. Notice that the rear boot or trunk on this car has a hinge going more or less horizontally across - which is different to the actual production version of the beetle - with a curved boot hinge which serves to shape the air vents above it so that the lower part of the air vent mirrors the top part of the air vent. On this car the bottom of the air vent is horizontal and does not mirror the top profile of the air vent. Indeed, making it appear an oddity. One would feel that such a detail would be important to the designers for continuity of the curve aesthetic which was to prove so successful. And indeed it appears from this design discrepancy... That this toy car was in actuality produced before the final production version of the beetle itself, and then for only a very short period.. Auctiva offers Free Image Hosting and Editing. The item "Horndlein (FH)1938 Germany VW Beetle KDF Wagen rare clockwork car works bing cko" is in sale since Tuesday, March 26, 2019. This item is in the category "Toys & Games\Vintage & Classic Toys\Clockwork/Wind-Up".